It is the South African Students’ provincial Athletics Championships, and I am standing with a group of students from all over the province, all eagerly awaiting the start of the Senior Mens’ 5000m Final. I can see that some of these athletes are excitedly engaging with their counterparts, verbally assessing who will be the one to look out for during the race. I stand aside. I am not wearing my hearing aids, and so cannot join in with their conversations. We line up, waiting for the gun to go off, and the race to start. I stand slightly behind the others, watching their feet. Without my hearing aids, I cannot hear the gun clearly, and am not sure whether it is a gunshot or some other sound. The only way I can know for sure whether the race has started is by looking at my competitors’ feet. They start moving forward, and I know the race is on. I run alongside a fellow athlete. I cannot hear the other athlete approach me from behind. The first I know that he is behind me is when he has passed me, and I now tag alongside this new athlete. And so we go, lap after lap until, eventually, I cross the finish-line. If I had not been counting the laps in my head, I would not have known that I had finished, as I cannot hear the bell that is rung to indicate that the final lap has begun. I look up to the stands, and see my team-mates, who have come to support me. I cannot hear what they are saying to me, but their smiles tell me I must have done okay. Later I learn that I have qualified for the South African Students’ National Athletics Championships. While living with hearing loss poses obvious life challenges, especially with accessing information and communication in a predominantly hearing world, my experience as a deaf person illustrates the danger of stereotyping, and that living with severe hearing loss is not a reason not to live life to the full. With the appropriate support, a person with hearing loss can do anything a person without hearing loss can do, except hear, or hear well. When I was born, I was born… dead. I had a zero apgar score. It took doctors several minutes to resuscitate me. I suffered oxygen deprivation, and had no muscle tone. During my first night of life, I experienced repeated seizures, each one lasting up to 12 minutes. I was airlifted to another hospital, and placed on life support for a short time. While I recovered my muscle tone, I lost most of my hearing. Despite the fact that, at the age of two, my mother recognised that I could not hear her, doctors insisted that my parents must accept that I was “retarded”, and would need special care throughout my life. My parents were even told that I should be placed in a home, as they could “always have other children”. It was only at the age of 5 that a speech therapist picked up that I was probably deaf, and that I was finally appropriately evaluated and diagnosed with bilateral sensori-neural hearing loss. 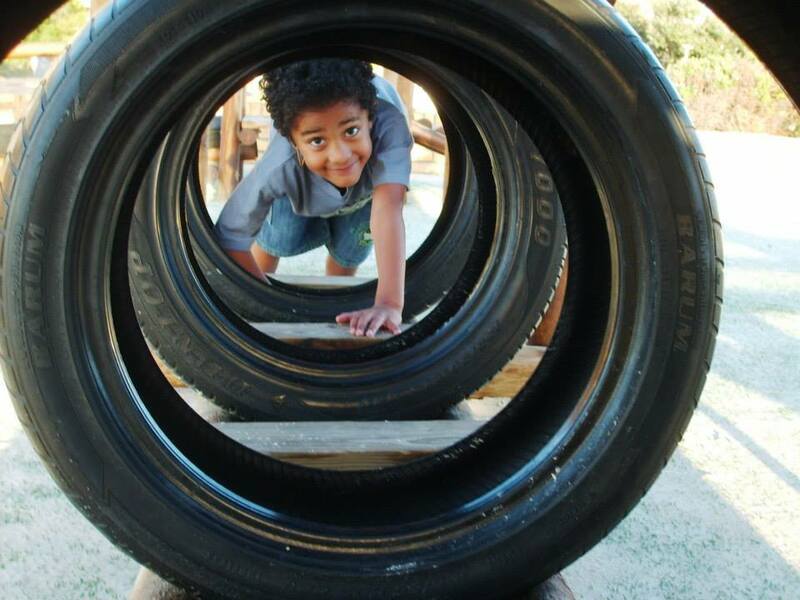 Just before my sixth birthday, I was fitted with my first pair of hearing aids, and it was only then that I began to learn to speak properly while simultaneously learning to read. 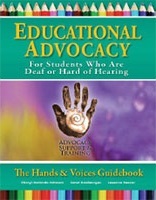 While my parents briefly explored the possibility of sending me to a school for the Deaf, they ultimately chose to send me to a “mainstream” hearing school, where I had to learn to cope in a confusing world where sound, although accessible through hearing aids, was not clear, and where both children and many adults did not understand what hearing loss actually entails. I refused to allow my hearing loss to be a barrier to experiencing the fullness of life, and chose to participate in domains which the “mainstream” world would normally consider out of reach for people who have a severe hearing loss. I sang in the choir, participated in school plays, won public speaking competitions (in two spoken languages), and achieved my Grade 8 Royal School of Music qualification in piano. Many people do not realise that deaf people have excellent rhythm. I felt the music from within. I was fortunate in particular to have a mother who believed in me, and pushed me to keep working hard to fulfil my potential. I started with piano lessons shortly after receiving my first pair of hearing aids, initially to help me to understand and process the rhythm of speech. I practiced for hours, made many mistakes, but loved the music so much, I stuck it through. Today I compose music, and can play by ear. It should be no surprise that my favourite composer is Beethoven. His Moonlight Sonata, which was his first composition after becoming stone-deaf, encourages me, and should encourage us all, to realise what the human spirit is capable of. Music, after all, is something that lives within every one of us. With support from my parents, who helped me understand what I could not hear in the classroom, I did well enough to be accepted at university. I studied at two universities, and in both cases, despite their international reputation as leading intellectual establishments, the lectures were not accessible for people with hearing loss, and most of my lecturers were not accommodating of my needs, even after I spent time discussing my hearing loss with them. For example, only one lecturer ever responded positively to my request to have subtitles placed on a DVD we had to watch for degree purposes. It is worth noting that South Africa has 21 universities, 15 technicons, and 129 Colleges. That is 165 tertiary institutions, all of which are aimed exclusively at the hearing community. Other than the National Institute for the Deaf’s NID College (based in Worcester, in the Western Cape), there are no tertiary facilities geared exclusively towards the education of the Deaf and hard of hearing in South Africa. Furthermore, only a handful of South African universities provide even minimal support services for Deaf and hard-of-hearing students. I got through university by asking a classmate to help me with note-taking, and by battling through the textbooks on my own, most often with no explanations of the text from lecturers. Ultimately, I graduated from UCT with a BA with three majors. I also hold an MA from UCT, in Religious Studies. Additionally, I completed the Postgraduate Diploma in Journalism at Rhodes University in Grahamstown, and a year of the postgraduate LLB. In 2006, I started working at the National Institute for the Deaf, based in the division known as DeafNET Centre of Knowledge. I was employed as a Researcher. I was very fortunate to secure employment as, according to the Integrated National Disability Strategy of 1997, only 0.26% of South Africans with disabilities were employed at that time – and the situation today is much the same. Given that 20% of persons with a disability had hearing loss, it is disturbing to note that only a small fraction of the 0.26% of persons with disabilities who are employed are Deaf or hard-of-hearing! Among my highlights during my 6 years working at the Institute for the Deaf was the opportunities I had to travel and lead the training of deaf people around Africa. I designed leadership and management courses for Deaf people, and one of these workshops took me to Bujumbura in Burundi. We spent two weeks there, at a time where the country was still dealing with the ravages of civil war, and there was talk of an imminent threat from Somalia. Everywhere we moved there were military barricades, with armed searches. On occasion we taught to the sporadic sound of gunfire. Once, at a barricade, a soldier mounted our transport, and pointed his rifle to my head. Our interpreter stood up and it emerged later that they negotiated for my life, and money was exchanged. Burundi was a surreal experience, but I have no regrets. These are the experiences that help give a life perspective, and meaning – and appreciation for our own personal journeys. I also had the opportunity to travel to Swaziland and Ethiopia, as well as Sweden, where I participated in an advanced training programme on disability and human rights in Africa. These experiences – from training in a warzone and walking through some of the poorest areas of Addis Ababa, to possibly the epitome of a first world country – have all contributed to my sense of what is possible for a human being to accomplish in her or his life. One does not need necessarily the materials available in a first world country to live out one’s potential. The people I trained were among the poorest of the poor, living with limited resources, and no active employment. But they had passion, they had drive, and it has been one of the most rewarding experiences of my life to follow their journeys post training and to see what they have done with the knowledge gained. One gentleman stands out for me. He overcame his circumstances of poverty, isolation through profound deafness, and no access to resources, to sit today as a member of his country’s parliament. If you have the drive and the passion, you can do anything in this life. Your potential is determined only by you. One of my personal highlights has been becoming active within Deaf Sports structures. It has been a huge privilege for me, as someone who, despite a severe hearing loss, grew up outside the Deaf Culture, to have been embraced by the culturally Deaf community. 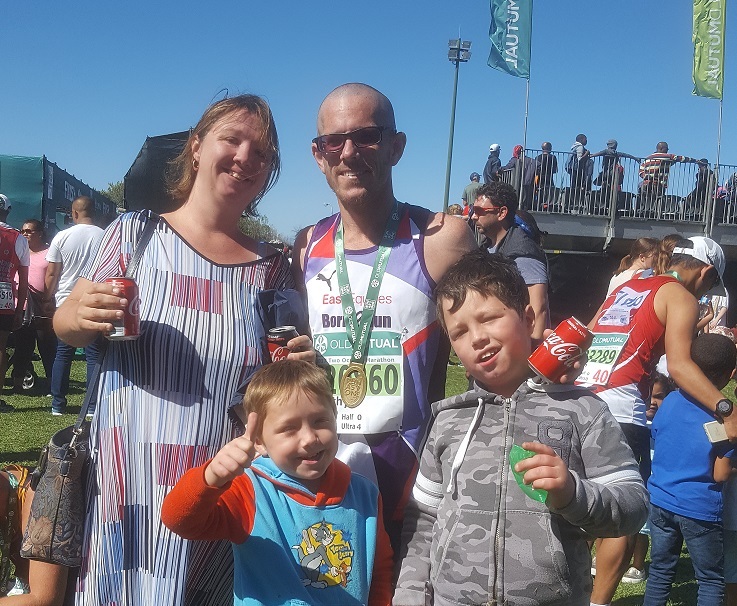 During our six years living in Worcester, where both of our sons were also born, I served as Chairperson of the Boland Deaf Sports Association, and as Athletics Administrator for the Boland, as well as the Western Cape. I also served as a member of the Western Cape Deaf Sports Federation’s executive committee, and chaired the mainstream Boland Disability Athletics commission, facilitating athletics for athletes who are deaf, visually impaired, use a wheelchair, and have intellectual impairments. I served as Secretary of the South African Deaf Cycling Association, and Development Officer for Western Cape Deaf Soccer, as well as team manager for Boland Deaf Soccer. In September 2007, together with a colleague, we reformed the South African Deaf Rugby Union, which had enjoyed huge success in the 1970s and 1980s especially, with a formidable Deaf Currie Cup, as well as playing three unofficial Tests against the Deaf All Blacks – with SA winning the three match series. By 2001, with no financial support, SA Deaf Rugby had disbanded. I established contact with my predecessor, who by then had emigrated to England, and that started a process which has been a huge learning curve for me and those who are part of our team. In short, over the next 7 years, we compiled a database, established contact with all the mainstream provincial rugby unions, did presentations, and held several meetings with SA Rugby – which culminated in our being accepted as an affiliated associate member of SA Rugby in March 2014. That September we held our first national trials, and in August 2014 we hosted our first official two-Test series, in Pretoria, against the current Deaf world champions. I served as team manager on this occasion. While we lost both Tests, we gained immeasurable experience. Losing is not always a bad thing. Often we learn far more about ourselves, and life’s greatest lessons in the process of loss. Both on the sports field, and also, more especially, in the context of life generally. While I love the vibe of sports administration, I am an active athlete. Holding dual citizenship, (South African and British), I have won my national colours in Athletics, representing Great Britain at both the World Deaf Athletics Championships, and the Deaflympics (Olympic Games for the Deaf), both times in the Marathon. At the 2008 worlds, held in Turkey, I finished 7th, running a Deaf Olympic qualifying time. I currently hold a number of British and South African Deaf records, including the 30km and 50km road records, and the 20, 25 and 30 0000m track records. In 2012 I was asked to serve as Technical Director for the second World Deaf Athletics Championships, held in Toronto, Canada, where I was privileged to work alongside the chief technical director for the IAAF, David Weicker. It was an extraordinary opportunity, and a privilege to be able to give back to a sport that has given me so much. I remain active in the hearing Athletics world, and have been awarded my provincial Masters Athletics colours for Boland and Border. I was afforded the opportunity to represent South Africa at the Africa Masters Athletics Championships, in Algeria, in 2010. 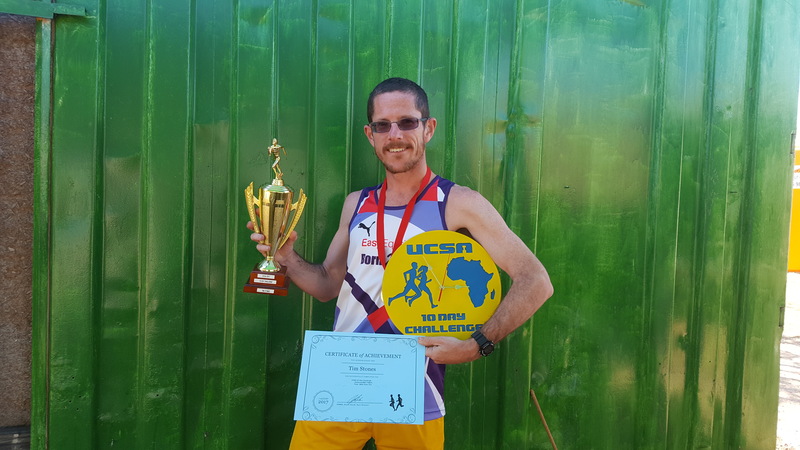 Recently (July/August 2017) I competed in my first 10-day race, where I broke the South African/African 35-39 age group record, running 886.748km in those 10 days. It also improved the British 10-day record. Subsequently I received an invitation to compete at the Ultra Corsica 1000km in 2018 – considered one of the most gruelling foot races in the world, with only 50 athletes invited, all of whom have had to meet stringent qualification standards. It is a huge honour to have been invited, and to again have an opportunity to represent my country in such an elite, and enormously challenging race. When I competed at both the 2008 World Deaf champs, held in Turkey, and the 2009 Deaflympics, in Taipei, I felt enormously privileged, not least because the very fact I was able to line up was nothing short of a miracle. In April 2007, I spent a month in hospital, undergoing tests for an illness that rendered me unable to walk unaided. While there was never certainty on what caused this muscle weakness, with the symptoms mimicking elements of both parkinsons and MS, the effects were severe. My muscles weakened rapidly, and I could not stand without wobbling, and could not even walk unassisted. It took me several months to learn to walk again without the use of a stick. It was an unbelievably dark period in my life. I remember the night, though, that changed everything. In the throes of deep depression, I prayed to God. I said to Him that He had given me the gift of running, and acknowledged that the way I understand life, and make sense of it, is as a runner. I prayed that, if it was His will that I must remain in a wheelchair, that He give me the strength to endure what I must. But that if He healed me, I would dedicate every run and race from that moment on to Him. Today I run, and I run to honour Him. I am grateful that God took me to that desperate state, for two reasons. One reason is that it taught me to deeply appreciate the gift of being able to run, irrespective of the result of a race. One can win a race, and break records, but records come and go, and one day we will lose and someone else will take over as champion. So what remains? Why do we run, or work where we work, or do whatever it is we do that we are passionate about? Is it to win, to be first, to be the best only? Or is there something far deeper that propels us? I have also learnt that God can give us the world and everything in it. But He can also take it all away in a heartbeat. If our trust and hope is in Him, then nothing else matters. We can lose everything, but still know that we have everything, because our identity is in Him, and not the things of this world. That belief is what sustains me, as a person who is deaf, who has survived debilitating muscle weakness, but also as the father of a son who lives with a terminal illness. Our firstborn son, Brendan, is 9 years old, and lives with a rare, degenerative brain disease called Moyamoya. This illness constricts the arteries in his brain, starving the brain of oxygen, triggering strokes. 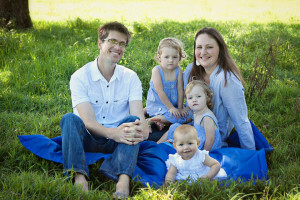 He suffered his first major stroke two weeks before his 4th birthday. By the time he was correctly diagnosed, he had had 3 major strokes, and several TIAs or minor strokes. In March 2014, at the same time as SA Rugby approved our Deaf Rugby as an associate member, our Brendan had bilateral revascularisation surgery at Red Cross children’s hospital in Cape Town. In most cases the child will only have had one stroke, if at all, by the time they have the operation – which is the only recognised treatment for Moyamoya, where successful operations will stem the occurrence of further strokes. The child would also normally only be operated on one side of the brain. In Brendan’s case, his condition was so severe they had to operate on both sides of his brain. He was in ICU for a week, and then High Care another 3 weeks, before being discharged using a wheelchair. Fast forward three and a half years, and Brendan, miraculously, no longer uses a wheelchair, except when especially tired. He walks, though, with a pronounced limp, and falls regularly. His speech remains very poor, slurred and drawn out, but he can talk. He has virtually no functioning in his right arm and hand. He suffers excruciating headaches, and suffered a 5th major stroke late 2016, as well as several minor strokes, as well as seizures. One of these seizures stopped his heart, necessitating CPR. He is our miracle boy and, while we are told he is not expected to live to adulthood, we cherish the time that we do have with him. I have come also to realise that God has a purpose in all our experiences, especially the times of pain and hardship. I used to wonder why God took away my ability to move, and placed me in a wheelchair, and then having to learn to walk again. Brendan was just 2 months old at the time. When Brendan had his strokes, and was dependent on a wheelchair, then I understood why what happened to me happened. It was to help me to be a better dad for my son, to have empathy and compassion for his situation and to be able to support him fully. 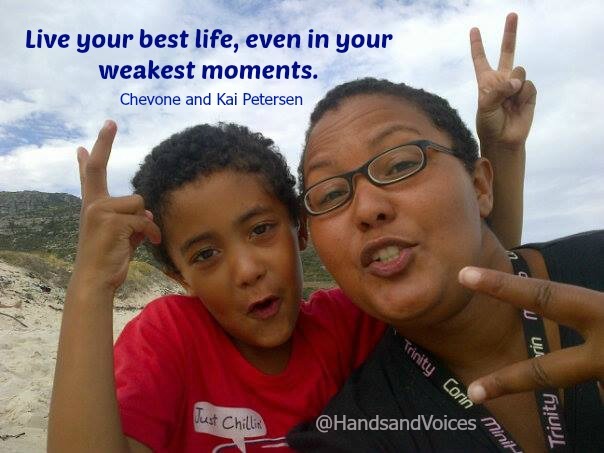 Living with our firstborn son has also taught us to fully appreciate the gift of life. Every day is a precious gift, and every moment is to be cherished purely for what it is. Take nothing for granted. Celebrate your loved ones. Cherish your time with them, and be there fully with them. They are what truly matter. Everything else is really not that important. People matter. In your work relationships it is our interaction with our colleagues and work mates that defines the ultimate success of your company. If you invest in your colleagues, you benefit, and your company will thrive. Life is all about the people in our lives. Cherish them. Cherish life. In October 2016 I had the privilege of participating in the Forever Resorts Mr Deaf South Africa pageant, held in Pretoria, South Africa. After an intense preparation week which culminated in a Gala Evening held at the Atterbury Theatre in Pretoria, I happened to be chosen first runner up. I also received the Charity Award, for raising the most funds for the Decibel Cochlear Campaign, an initiative of the Miss, Mrs & Mr Deaf South Africa organisation, which aims to raise awareness of deafness and the realities and experiences of deaf people in South Africa, as well as essential funds to support deaf people, especially children, to be able to receive the gift of sound through acquiring a cochlear implant. 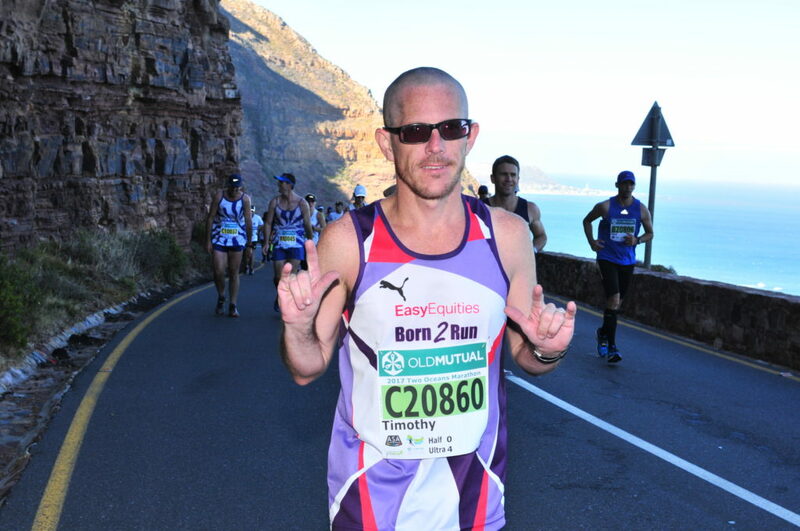 Following the pageant I was approached by SA’s foremost long ultra athlete, Johan van der Merwe, and invited to represent South Africa at the 6-day Race of Nations World Trophy, being held in Hungary in May next year. He advised me to run a 48 Hour race that took place that December in preparation for the international adventure, to gain experience in longer ultra distance racing. The 48 Hour race was a journey of the soul, held on a 1km circuit at a sports complex in Johannesburg. Some people thought I was completely crazy to take on what I knew would be extraordinarily tough physically and mentally, a race that would push me to the very extremes of endurance. But it is precisely because it is so hard that I wanted to attempt this race, and the subsequent 10-day race I competed in this year (I chose to do that over the 6-day world trophy, to gain more experience before going overseas). For both the 48 Hour and the 10-day races, I became the first person from my province to officially complete these events, and the first deaf person in the world to do so. Should I compete at the Ultra Corsica 1000km next year, and complete it, I will become the first deaf person in the world to complete 1000km in an official race. But that is not why I am run these races. I hope to inspire other people who are deaf, or who live with some kind of disability, or who do not live with a disability but have other life challenges, to never give up on dreaming, and to chase their dreams, whatever they may be for each one of us. To see the possibilities in life, the enormous potential, no matter the circumstances that confront us. To never lose hope, to keep the faith, no matter what challenges or trials befall us. To not allow our circumstances to define our potential, but to write our OWN story. I ran the 48 Hour and the 10-day on behalf of the Decibel Cochlear Campaign, an initiative of the “Miss, Mr & Mrs Deaf SA” organisation, specifically to support multiply disabled deaf children (who attend Whispers Speech and Hearing Centre, based in Pretoria) – aiming to raise awareness of and funds to help them receive the gift of sound through acquiring a cochlear implant. 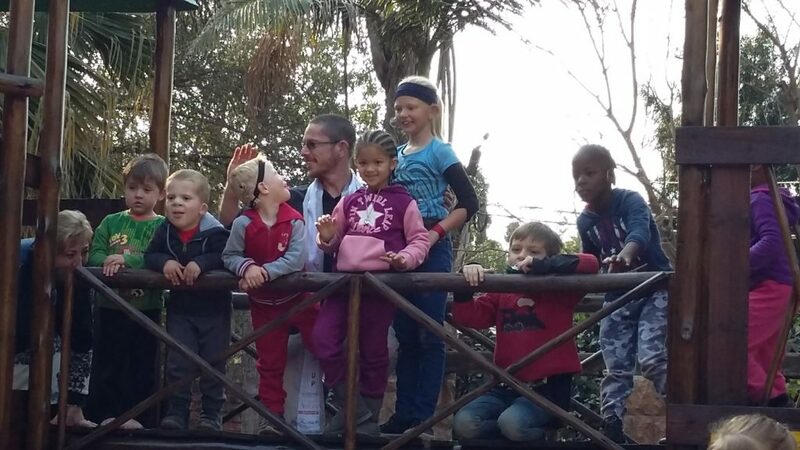 It is a privilege for me to go the distance for these children. I hope in doing so they will be encouraged to always keep on dreaming their dreams, to chase the wind, and to choose to see the rainbows through the storms. That is my prayer also for our beloved Brendan. It is my prayer also for each of you who have taken the time to read these words. Athletes with a disability, athletes who are deaf, encounter many hurdles as they chase the wind. Ultimately, it is our endurance, and our courage to persevere despite the obstacles we face, that will be our greatest legacy. You are the master of your fate. You alone determine the potential of your life. This is your moment. Carpe diem. Seize the day! Choose to make your lives spectacular. It has been a crazy 4 months, so much has changed, and so much has been explored! There have been moments emotionally lower than I thought possible, but there have certainly been rays of sunshine peeking through our cracked lives and fractured dreams. I’ve been catapulted about as far out of my comfort zone than I could ever imagine, into the deaf world. A world that I had never given a second thought to. Initially that was terrifying; change and the forced exploration of the unknown is seldom comfortable. But in the last two months I have had some life changing discoveries. I’ve realized that my attitude in spite of circumstances AND feelings is always a choice. That has been an empowering realization! I’ve learned to give pride the backseat and ask for help, and to embrace my own weakness and grief. I’ve found that it has been the “allowing myself to feel” experience as well as acknowledging that there’s actually no way possible that I can do this on my own, that has ironically, given me strength.